Public company credit risk is often underestimated given the access these companies have to capital markets. This issue is exacerbated given eight years of record low interest rates and ballooning asset prices. Such a sanguine outlook appears increasingly misguided today. Financial distress is not simply limited to the category of corporate bankruptcies, it also includes loan defaults. A company can default on its debt and still avoid bankruptcy. Financial defaults are actually three times more common than bankruptcy. This statistic is important since most bankruptcy scenarios prioritize banks over trade claims in the repayment hierarchy. These companies could impact commercial creditors and other financial counterparties, if they haven't already, e.g., Gymboree and GulfMark Offshore. Each company, including Gymboree and GulfMark prior to their bankruptcy filings, shifted between a credit rating of "CCC" and "D" over the last 12 months. This list is a fraction of the many high-risk public companies CreditRiskMonitor tracks in real time. Note that credit ratings are also one of the multiple data components used in the FRISK® model computation. Risk managers use the FRISK® score to help monitor financial risk for their customers and suppliers alike. It provides an early warning of financial risk with 96% accuracy. Armstrong Energy, a coal producer, has held a FRISK® score of "1" since March 1, 2017, which is the lowest possible rating on the FRISK® scale. Less than six months later the company defaulted on its senior secured notes. Management also disclosed in its latest MD&A that it may seek a bankruptcy restructuring. Renowned retailer J.Crew completed a distressed debt exchange in July 2017. Following that situation, however, the company’s leverage has continued to swell. In the second quarter, debt to assets increased to an alarming level of 1.45 times. Any further deterioration in sales revenue and/or margins would likely put the company back in jeopardy with creditors. iHeartMedia, with more than $6 billion in annual sales, nevertheless is a struggling radio broadcasting company. Primarily due to the company’s high interest payments, it is still far from profitable. In the second quarter, its cash and equivalents fell to $260 million, the lowest level over the last five quarters, and working capital slipped to $97.2 million. Debt refinancing options could narrow from here, especially as the sum of maturities over the next three years exceeds $8 billion. 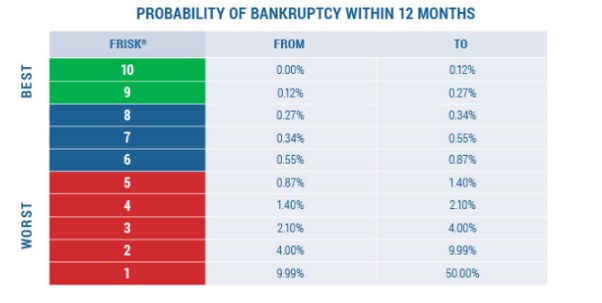 CreditRiskMonitor's proprietary FRISK® score uses bankruptcy as its “statistical target” because it is the most extreme and most easily measured level of financial distress. Yet the FRISK® score tracks financial distress at all levels and can provide counterparties with an early warning signal of pending trouble, such as a default. For the three operators specifically mentioned above, most if not all of their assets are liabilities, putting trade creditors in a dangerous position. Those with an economic interest in any of these companies should carefully determine if or when a credit default might occur and adjust risk exposure accordingly. But these are just examples of a larger issue: Public company credit risk is widespread and continues to increase. Risk managers should use the appropriate tools to adjust for these risks before it's too late. 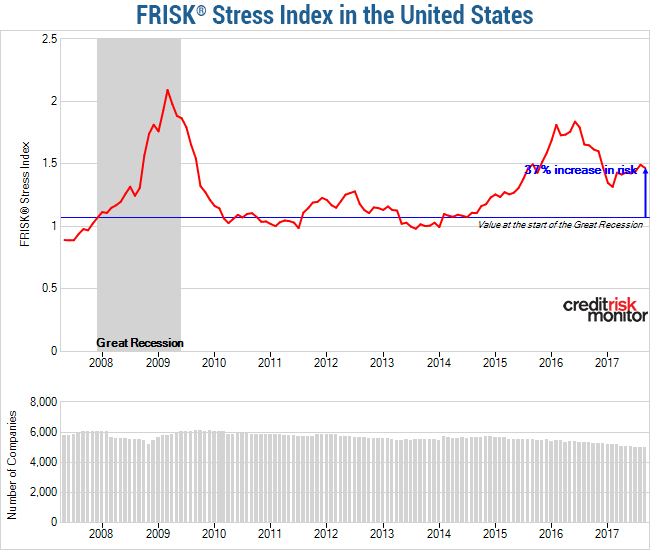 The FRISK® Stress Index is a model that provides the average probability of failure for a group of companies (e.g. by industry, portfolio, or country) over the next 12 months. The level of risk is measured through a scale of "0" to "50," with "50" being the most risky.